The Big Laser is only available to Hive13 members who have been certified on its use & care. To become certified, you need to take the certification class. Contact us about scheduling one at other times. 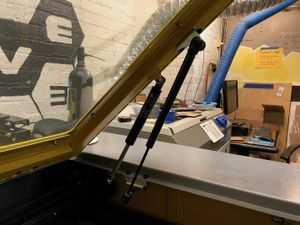 The pneumatic cylinders on our laser were bad when we received the laser which cause some near accidents when the lid wasn't supported and came crashing down. Helper struts have been added and now the lid will stay up. Still crashes down the last few inches. Perhaps we can add a closing damper. The handle could use an upgrade. If only we could machine stuf . . . . Either move the exhaust fan to a better location or upgrade to actual filtration inside the space (this has some major benefits such as being able to move a lot easier, not exhaust our climate controlled air, helping cut down on rather toxic air pollution outside, actually /cleaning/ the air in the hive which we have issues with). Replacement sensor is a TL-Q5MC1 inductive sensor. They are commonly available on ebay. We use a 1" aluminum cylinder as our chunk of metal to detect. 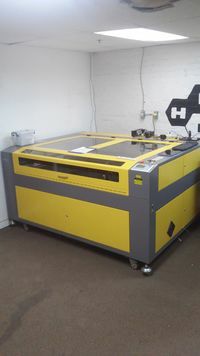 This is the same setup we use on the smaller Laser Cutter. The picture on the left show approximately how the new sensor is mounted. The sensor had to be mounted backwards AND the bracket had to be mounted backwards so it is out much further than it needs to be. The picture on the left shows the wiring for the new sensor. Far left (red) is 24V power, middle is the output signal, far right is ground. The main thing that needs to be done is a 24V line needs to be run to the new sensor. The other two wires are what was used by the old pen style auto z zeroing sensor. 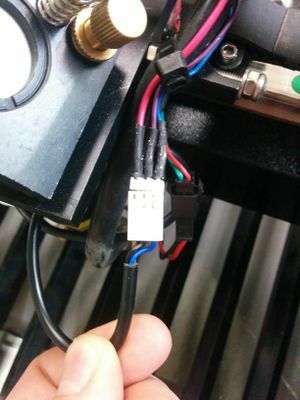 A replacement original sensor has been added back to the laser, this is a mechanical sensor. 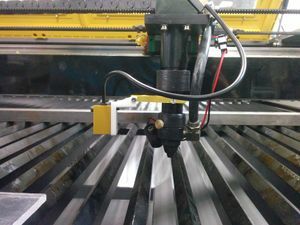 During the installation of the sensor it was learned that there is a partial failure in the laser's circuitry. To counteract the failure a pull-up resistor of 330K ohm is added in line between the 24v line and the output line.